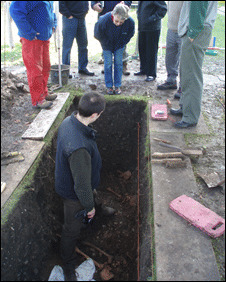 The site was identified by Victoria County History Team, who excavated it along with volunteers from the South Oxfordshire Archaeological Group. The lost church of Bix Gibwyn was abandoned in the late 16th or early 17th Century. Radiocarbon dating by the Oxford University Research Labs revealed that the remains are about 800-years-old. One of the bodies has been identified as that of a woman in her 20s who had severe dental abscesses. Stephen Mileson, from Victoria County History, said the find had important implications for reconstructing the pattern of medieval settlement in the area. "We also found significant amounts of pottery, which is being looked at by the experts," he said.